We perform transperineal MRI-guided biopsies for prostate cancer at the wide-bore 3T MRI scanner in AMIGO. The wide-bore 3T MRI (Siemens), combined with custom built software and hardware, was made possible through NIH grants, enabling us to launch this unique and clinically useful program from the inception of the AMIGO suite. Men with either recurrent prostate cancer post-surgeries or radiation treatments, or with consecutive negative ultrasound-guided biopsies but rising PSA are enrolled in our program. In addition, we have recently begun a new clinical research program to investigate the feasibility of focal ablation therapies for prostate cancer using MRI-guidance. Extending the software, hardware, and multi-parametric MRI methods developed in MRI-guided biopsies, we perform cryoablation of the dominant lesion to manage cancer recurrence following treatments. In the patients who have been successfully treated so far, the advantage of planning, targeting, and guidance under wide bore 3T MRI in AMIGO has been demonstrated. The wide bore scanner allows patients to remain in the scanner during the placement of the cryoablation probe under MRI guidance. By keeping the patients statically in the scanner, a detailed ablation plan, produced at the beginning of the procedure, can be overlaid onto the intra-procedural images without image registration, a significant advantage over other potential approaches in which the patient would be moved into the scanner for imaging, then out of the scanner for ablation probe placement. Preprocedural planning. The radiologist reviews the preprocedural multi-parametric MRI exams to identify suspicious targets. Patient preparation. 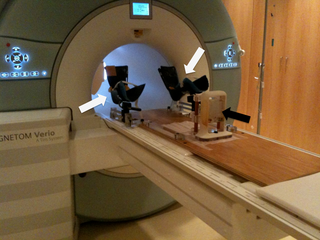 White Arrows: Custom-made MR imaging-compatible table top with leg support. Black Arrow: Template with holes for the accurate biopsy needle placement is placed against the patient's perineum. Patient preparation. The patient is taken to the 70 cm wide-bore 3T MRI and placed on the prostate intervention table in the lithotomy position. 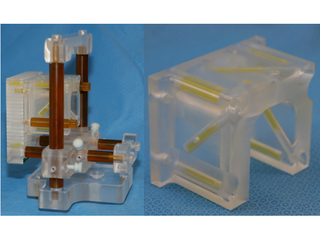 The sterile stationary frame and the template with the Z-frame are set up. Patient preparation. View of the template with the Z- shaped calibration frame (Z-frame). Intraoperative MRI. A 2D slice image of the Z-frame for the Z-frame registration is taken. The 3D view of the model of the Z-frame and the template overlaid on the slice image is displayed on the navigation software (3D Slicer). Intraoperative MRI. A second intraprocedural 2D multi-slice T2-weighted (T2W) image is obtained. For the registration, the region of interest is marked through manual cropping, so that afterwards, the two images become joined. Intraoperative Planning. Through projection of all the intraprocedural and preprocedural targets onto the intraprocedural T2W image, 3D Slicer selects the optimal template holes for biopsy needle insertion and the depth for the needles. On the 3D view, the optimal needle path is calculated, (Green = Needle Path, Red = Target, Blue = Template, Yellow = Z-Frame). Needle Placement. Following the Z-frame detachment from the template, the radiologist applies local anesthetic and inserts an 18-gauge × 15 cm MRI-compatible core biopsy needle through the selected hole until it reaches the calculated insertion depth. Monitoring. Upon needle insertion, a 2D needle confirmation image is obtained in either the axial or the coronal plane at the planned target position to confirm that the needle was placed at the desired position. The needle placement was confirmed by the artifact shown on the real-time image. If the needle is not found sufficiently close to the target lesion, the needle is reinserted through a selected hole based on MR image guidance. Upon satisfactory placement of the needle tip over the target (based on the MR), the tissue samples are collected, labeled, and sent for site-specific pathological examination. Robert A. Cormack. Image-Guided Prostate Brachytherapy. Ch.57. Part V. mage-Guided Clinical Applications. In Ferenc A. Jolesz (Ed. ), Intraoperative Imaging and Image-Guided Therapy. New York, NY: Springer; 2014. pp. 761-70. Systematic transrectal ultrasonography (US)-guided biopsy is the standard approach for histopathologic diagnosis of prostate cancer. However, this technique has multiple limitations because of its inability to accurately visualize and target prostate lesions. Multiparametric magnetic resonance (MR) imaging of the prostate is more reliably able to localize significant prostate cancer. Targeted prostate biopsy by using MR imaging may thus help to reduce false-negative results and improve risk assessment. Several commercial devices are now available for targeted prostate biopsy, including in-gantry MR imaging-targeted biopsy and real-time transrectal US-MR imaging fusion biopsy systems. This article reviews the current status of MR imaging-targeted biopsy platforms, including technical considerations, as well as advantages and challenges of each technique. PURPOSE: To determine the detection rate, clinical relevance, Gleason grade, and location of prostate cancer ( PCa prostate cancer ) diagnosed with and the safety of an in-bore transperineal 3-T magnetic resonance (MR) imaging-guided prostate biopsy in a clinically heterogeneous patient population. MATERIALS AND METHODS: This prospective retrospectively analyzed study was HIPAA compliant and institutional review board approved, and informed consent was obtained. Eighty-seven men (mean age, 66.2 years ± 6.9) underwent multiparametric endorectal prostate MR imaging at 3 T and transperineal MR imaging-guided biopsy. Three subgroups of patients with at least one lesion suspicious for cancer were included: men with no prior PCa prostate cancer diagnosis, men with PCa prostate cancer who were undergoing active surveillance, and men with treated PCa prostate cancer and suspected recurrence. 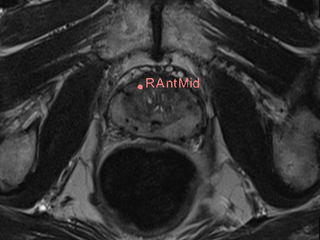 Exclusion criteria were prior prostatectomy and/or contraindication to 3-T MR imaging. The transperineal MR imaging-guided biopsy was performed in a 70-cm wide-bore 3-T device. Overall patient biopsy outcomes, cancer detection rates, Gleason grade, and location for each subgroup were evaluated and statistically compared by using χ(2) and one-way analysis of variance followed by Tukey honestly significant difference post hoc comparisons. RESULTS: Ninety biopsy procedures were performed with no serious adverse events, with a mean of 3.7 targets sampled per gland. Cancer was detected in 51 (56.7%) men: 48.1% (25 of 52) with no prior PCa prostate cancer , 61.5% (eight of 13) under active surveillance, and 72.0% (18 of 25) in whom recurrence was suspected. Gleason pattern 4 or higher was diagnosed in 78.1% (25 of 32) in the no prior PCa prostate cancer and active surveillance groups. Gleason scores were not assigned in the suspected recurrence group. MR targets located in the anterior prostate had the highest cancer yield (40 of 64, 62.5%) compared with those for the other parts of the prostate (P < .001). CONCLUSION: In-bore 3-T transperineal MR imaging-guided biopsy, with a mean of 3.7 targets per gland, allowed detection of many clinically relevant cancers, many of which were located anteriorly. Kapur T, Tempany CM, Jolesz FA. Proceedings of the 7th Image Guided Therapy Workshop. Image Guided Therapy Workshop. 2014;7 :1-60.